When I decided to conduct my classics challenge (to read fifty classic in five years) in the same haphazard and chaotic way that I conduct the rest of my reading – without creating a list or plan in advance – there were still one or two writers I was determined to include. Foremost among these was Mikhail Bulgakov – a writer I had mysteriously managed to avoid up to this point. Given that so much of his work is readily available in English – Alma Classics, and translator Hugh Aplin, are to be particularly praised here – I was bereft of excuses and decided to make a start with Diaboliad, a collection of four stories originally published in 1925 (the Alma Classics edition makes a point of mentioning that it does not include The Fatal Eggs – which they publish in a separate volume – leading me to assume it originates from the same place). With his bandaged eye, Korotkov misreads a memo at work the next day and is sacked. The rest of story concerns his attempts to win back his job, a task which is not aided by the usual labyrinthine Russian bureaucracy, and the involvement of not one, but two sets of doubles. At times the story moves with the frantic pace of a car chase, driven by Korotkov’s desperation to understand and be understood, lurching on two wheels between farce and fantasy. The new inhabitants are canny enough to keep on the building supervisor, Christy, who is able to maintain some semblance of order until the heating fails. The third story, ‘A Chinese Tale,’ concerns a Chinese man who drifts into the Red Army but is accepted due to his skill as a machine-gunner. The man remains a rather opaque racial caricature but the focus here is on the ironic ending. The final story borrows its title, epigraph and characters from Gogol. ‘The Adventures of Chichikov’ was what Gogol had originally planned to call Dead Souls, Chichkov being the novel’s main character. 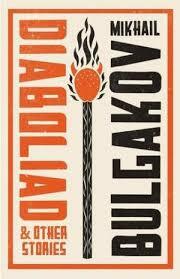 Bulgakov makes use of him and other characters from Gogol’s works to create a story of greed and corruption in Soviet Russia which also seems to foreshadow the Russian oligarchs of today. That the story transfers so easily is a sign that Bulgakov’s main aim was to expose humanity’s flaws, whether individual or institutional, rather than simply satirise one political system. Its seems clear from this slim volume that Bulgakov saw himself to be connected to the great Russian writers of the nineteenth century like Gogol and Dostoevsky, walking a high-wire reality with madness always lying a misstep away. His imagination may be more drawn to farce and slapstick, more likely to make you laugh than cry, but that does not disguise the same darkness lying beneath. You are currently browsing the archives for the Mikhail Bulgakov category.